Rarely have I seen a candidate come across not only as embodying these characteristics, but as being utterly candid, humorous, and self-effacing. If you aren’t from Montana or missed the long Friday, Nov. 30th Rachel Maddow interview with him, you may not understand why Senator Jon Tester could be a formidable 2020 Democratic Party candidate. Tester hasn’t been a well-known politician. He is best known outside of Montana for incuring the wrath of Donald Trump who called for him to resign because in his role as ranking member of the Senate Veteran’s Affairs Committee he objected to the president Trump nominating hs personal physician, Ronnie Jackson, to be head of the VA. This led to Jackson withdrawing his name. Descriptions like down to earth and relatable are overused. Even so, this is what came to mind as the interview unfolded. Rarely have I seen a candidate come across not only as embodying these characteristics, but as being utterly candid, humorous, and self-effacing. I saw him breaking the mold of what American’s consider presidential at the same time as creating a brand-new mold. He comes across as the quintessential everyman. Watching him brought to mind the most well-known Republican politician, a man known for a very different kind of candor, who is also a literal heavyweight, Chris Christie. Both appear physically comfortable in their hefty bodies. Tester looks like he could still wrestle a steer to the ground and Christie comes across as a jolly Santa Claus, albeit a Santa you don’t want to get on the naughty list with. Christie’s candor couldn’t be more different from Tester’s candor. Both of the men are direct and blunt, but Testor’s is easy-going farmer blunt and Christie’s is rough-and-tumble northern Jersey take-no-prisoners blunt. In his interview with Rachel, Tester talked about how his parents inculcated the value of being honest and playing fair in him. Christie is known for his unashamed twisting of the truth and being a dirty street fighter. Tester is a man who wears his ample heft with pride. He took it in stride when Rachel joked about him being someone who slaughtered and ate his own beef. She didn’t mention the fact that he lost the middle three fingers of his left hand in a meat-grinder accident when he was nine. Christie has been candid about his struggle to lose weight and hasn’t been shy about being photographed indulging in protein-free treats. Chris Christie could be the best hope for moderate Republicans to bring their party back from its descent into Trumpism. If this was the ticket, the debates would not be boring. Tester and Christie are equally matched and both have their wits about them. On the other hand, if Trump manages to pull his cojones out of the fire and ends up running for a second term, Tester would make mincemeat out of him in the debates because by 2020 Trump will probably be more unhinged off-script than he is now. I don’t have a sense who would have the edge if the race if it came down to Tester vs. Christie. 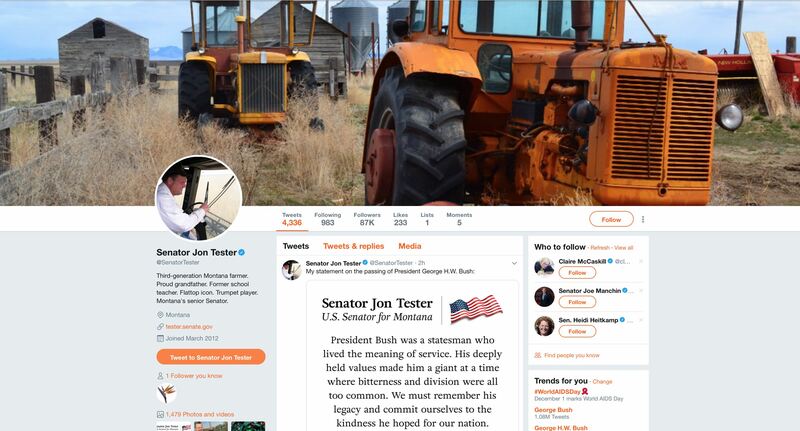 Obviously, Tester will relate to rural voters, and his having a working class background would play well with blue-collar workers. He admitted to Rachel he wasn’t conversant with urban problems but he came across as someone who would easily be able to address big city problems. There’s no way he’d choose a Ben Carson to head HUD. Christie could win over the right leaning suburban voters. Tester considers himself to be a moderate Democrat. (You can read his political positions here.) The progressive wing of the party might be reluctant to enthusiastically endorse him. However the ticket could be balanced with a younger progressive vice presidential candidate would be assured a prominent role in governance, and who could be groomed for a presidential run in eight years. The Republican’s smartest choice if they nominated Christie would be to select a female, possibly a black or Hispanic woman, to run as vice president. At least if Christie became president it wouldn’t be a nightmare scenario for Democrats, especially if they took the Senate and kept the House. Then we would have sane and competent government with working checks and balances. Third-generation Montana farmer. Proud grandfather. Former school teacher. Flattop icon. Trumpet player. Montana’s senior Senator. President Bush was a stateman who lived the meaning of service. His deeply held values made him a giant at a time when bitterness and division were all to common. We must remember his legacy and commit ourselves to the kindness he hoped for our nation. Retired licensed clincial social worker, psychotherapist, and mental health center director. Was one of the first members of Dr. John D. Gartner's Duty to Warn group of mental health professionals warning publicly that Trump was a malignant narcissist and that his psychopathology made him too dangerous to be president. Chris Christie a “moderate” Republican? Seriously? Yeah. He did NJ a lot of good. He has waaaaay too much baggage. You know. The bridge thing. Of course, the buck did not stop at him. James, aside from the fact that there would have been no story title without the two meanings of heavyweight, I do think that compared to the far right lunatics in the GOP he is a moderate who happens to have that Bridgegate thing spanning his career like the GWB crosses the Hudson. Mostly though, I think that like Beto, Tester is another emerging Democrat who could emerge as a potential candiate for president or vice president. So it would appear that “moderate” is subjective. Regardless, I don’t think that today’s GOP will settle for “moderate.” Just as I hope that the Dems won’t settle for “moderate.” There are differences between the 2 parties, and I for one, would like those differences evident even to the most ignorant Republican voter.